Whisk the first four ingredients together in a heat-proof bowl, taking care to break up any lumps, making them as small as possible. In a medium-sized, heavy non-stick saucepan, bring the milk to a gentle boil. Remove the pan from the heat, and very slowly pour about 1/3 of the milk into the egg mix, whisking constantly. This will temper the eggs so they don't cook solid. When the outside of the bowl feels warm when touched, whisk the rest of the milk into the mix. Quickly wash out the saucepan, and pour the entire pudding mix back into it. Add the banana liqueur and whisk constantly over medium-low heat for three to four minutes until the pudding is nice and thick. Remove the pan from the heat, and slowly whisk in the vanilla and butter. Pour the pudding into a large bowl, and lay a piece of plastic wrap directly on the pudding's surface. Refrigerate for at least three hours to chill completely. Cut the bananas into small chunks, reserving 6 individual slices for garnish, and gently stir the chunks into the chilled pudding. 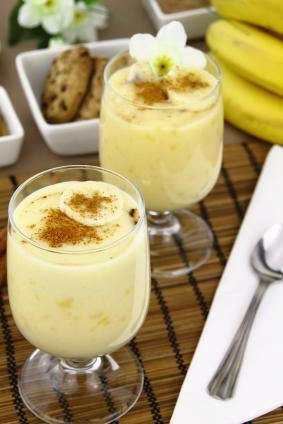 Spoon the pudding into six serving cups, top with one slice of banana and a sprinkling of cinnamon, if you like, and serve immediately.